Medical marijuana patient cultivator and dispensary operator Robert Schmidt was raided by the DEA in Sonoma County on September 12, 2002. Agents claim to have uprooted 3,454 plants at the club's garden in Sebastopol. In July 2005, Schmidt pled guilty and was sentenced to 41 months in federal prison and 3 years of supervised release. He was released to a halfway house on January 2, 2009. 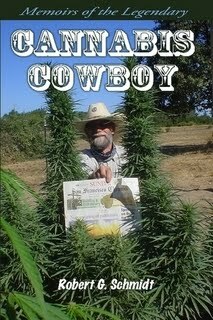 Memoirs of the Legendary CANNABIS COWBOY is an action packed story about the adventures of Robert G. Schmidt as a marijuana smuggler in the 70's and 80's and then as the head proprietor of Genesis 1:29, a medical cannabis dispensary in northern California. With a family history of "rum runners" that used wooden speedboats to bring Canadian booze into Prohibition era America, Robert's career begins with helping draft dodgers escape the Vietnam War and soon escalates into international excitement and danger smuggling tons of marijuana. The riches gained during high-flying early years are lost to betrayal and prison. After a time in the grip of drug and alcohol abuse romance brings stability that is soon interrupted by a new law that allows medical cannabis use in California. Ex-marijuana smuggler Robert establishes Genesis 1:29 to grow and distribute medical cannabis and for a time business booms. Expansion of growing operations to a ranch in Sebastopol leads to a DEA raid on September 12, 2002. After years of legal wrangling Robert made a deal and was sentenced to 41 months in federal prison. While incarcerated in Leavenworth, Kansas, Robert wrote this sometimes-unbelievable account of his fascinating life and adventures on the high seas.